Looking to make your own face oil blend or face serum? It’s really so easy! 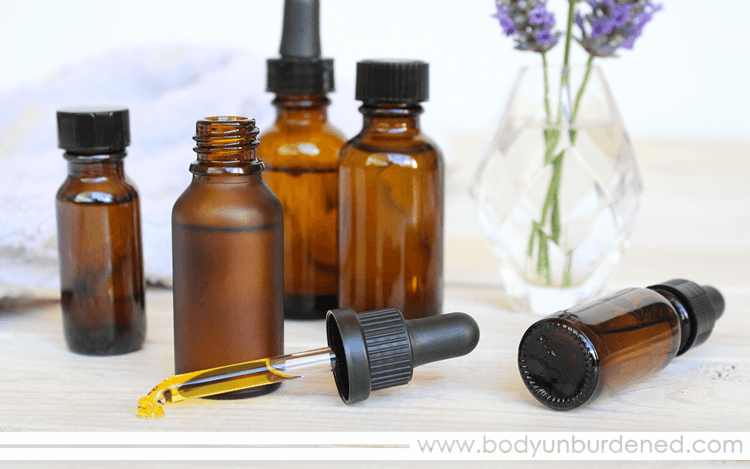 Let’s take a look at the difference between essential oils and carrier oils, which of each are best for your unique skin needs, how to properly dilute essential oils in carrier oils, and how to use your custom face oil blend. Around here, we’re fanatic for face oils. It’s not just me. Nope. I’m proud to say that I’ve created a whole tribe of face oil groupies. Naturally, I get a lot of questions about how exactly to blend face oils and essential oils. So I wanted to create a post dedicated to just this — to help clear up any confusion and walk you step by step through how to make a custom face oil blend perfect for your skin. There is a big difference between a carrier oil and an essential oil. Carrier oils are derived from the fatty portion of plants, nuts, and seeds. Think: olive oil, argan oil, jojoba oil, rosehip seed oil. Whenever I say “face oil” I’m referring to carrier oils. Essential oils are distilled from the petals, leaves, bark, stem, and even roots of plants. They are volatile, very aromatic, and very potent. They can be thought of as extremely concentrated herbal extracts. Think: lavender essential oil, rose essential oil, tea tree essential oil. You must dilute essential oils in carrier oils. They are far too concentrated to be applied straight or undiluted, and can really irritate the skin when not diluted properly. Opinions on proper essential oil dillution for skincare differ, but everyone generally agrees that the sweet spot is somewhere between 1-4%. That is, essential oils should make up just 1-2% of the final mixture, with the remaining 96-99% of the mixture comprised of carrier oils. You can choose just one carrier oil or as many as you like! But I think just 1-3 is really all you need. For all of the details on these oils and their benefits, visit The Best Face Oils by Skin Type. As with carrier oils, you can choose just one essential oil or any many as you like! I think 1-5 is all you need. For all of the details on these oils and their benefits, visit The Top 10 Essential Oils for Skincare. I prefer 2% dilution — that is, the essential oil(s) will make up just 2% of your final face oil blend and the carrier oil(s) will make up the other 98% of the blend. So since 1 oz is 29 mL and every mL is 20 drops, for every 1 oz of carrier oil you should add no more than 12 drops of essential oils (if also choosing to follow a 2% dillution). The easiest way to blend your oils is to fill a 1 oz glass dropper bottle (amber or cobalt glass bottles will protect the delicate ingredients) with your carrier oil(s) and then add your essential oils. Screw the top on and give it a little shake. It’s really as simple as that! Vitamin E oil helps preserve the delicate fatty acids in your carrier oils and prevent them from going rancid. This particular vitamin E oil that I use should make up no more than 1% of your final blend. So for a 1 oz blend, you would add just 6 drops of the vitamin E oil. So now you know how to make a custom face oil blend. But are you wondering how to use it? Face oil blends make wonderful natural moisturizers but can also be used to cleanse skin. Yes, oil can actually clean skin! Get all the details with The Oil Cleansing Method 101: How to Wash Your Face with Oil. If using your face oil blend as a moisturizer, simply apply after washing and applying toner and serum, if you do so. Remember: skin hydration and skin moisture are two different things! If your skin seems to be tight, dry, or flaky even when using your face oil blend, a little hydration is likely in order. Do you have a favorite face oil blend? Any tips or tricks? Please share with us in the comments below! What are your thoughts on fractionated coconut oil as a carrier oil? I’ve been washing my face with fractionated coconut oil and baking soda with great results for a few years now, my skin is changing though so I’m going to axe the baking soda and add lavender oil. Great post, thanks! Also how do you use your oils? To wash your face or post washing? Love this! Frankincense and lavender are my favorites for skin. I like to mix argan, rosehip and sea buckthorn but I’ve never thought to add vit E, will have to do that for the next batch! Thank you for your post, it’s very informative. I plan on making some today. You make it so easy, and I love how you lay out the different oils for different skin types! This is such a good post that I am going to pin and refer back to again and again! Ohh that sounds like a great combo! That are definitely 2 of the best! What about Castor Oil for oil cleansing? Hi Nadia – your site has totally changed the way I think about self care – thank you!! Question for you: how long does a face oil blend last? How long can I use it before it goes bad, and how do you sterilize your jars? Thanks! I think my question is whether we switch back to the soap after a period of oil wash? Or sometimes we can use oil, the other times soap? Or we just keep using oil to wash our faces? You really inspired me to make one! I have the dropper bottles in my Amazon cart. Just wanted to know what you would recommend for every day use- I want something I can use instead of a moisturizer that I can also wear under make up so very lightweight. I have combination acne-prone skin with redness and mild scarring. Please let me know what you would recommend! I’m excited to hear from you. Thank you in advance! Hi, I am new to your blog, very informative, can you clarify how many drops per mL? Do you mean every Oz is 20 drops? if I follow the 20 drop per ml, 29 ml would be 580 drops!Thanks!! love your blog! That’s right – 1 oz is 580 drops. But we’re only working the equation out to figure out the correct number of drops of essential oil(s) to add, since they need to be diluted. Does that make sense? Hey, Nadia. I like your blog! Your posts are very informative and easy to understand. Natural oil-based skincare regime is absolutely great! I’ve been using grapeseed oil as face moisturizer and argan oil around the eyes area. I want to start mixing carrier oils with essential oils. In this post you said the essential oils should not be more than 15drops. What if I want to use 2-3types of EO? Should I use 15drops max for each EO so I get 45drops max in total? Or 15drops is a number for total drops so I can only use 5drops each? Thank you for being so helpfull! Hi, Vashi. Yes, that is 15 drops of essential oils TOTAL. Do you have any remedy for facial hair; especially under the chin? Thanks. Thanks for this information. For the 2.5% dilution, do the essential oils come to a total of 15 drops and if so, do you play with the individual number of drops for each essential oil chosen? Hi! I loved this post! I have been oil cleansing for years (2/3 organic EVolive oil, 1/3 castor) and have seen such an improvement in my skin. I have skin that is typically dry (I live in CO) but my chin breaks out routinely with a few deep, painful acne spots. After the breakout heals, redness remains for a long time. I am looking for a good combination to reduce redness, scarring, and future breakouts or at least the severity of them. I would also love to have a regime in place to deal with the breakouts when they come along. I have many essential oils at my disposal and am willing to try something new. Currently, I use sweet almond oil as a moisturizer, occasionally adding in frankincense and lavender. Yes, the 15 drops is the TOTAL amount of EOs (so, for example, 8 drops lavender, 5 drops fank, 2 drops rose). Wondering where you got this from?? Everything I’ve researched and studied has said 1) it really depends on the EO and 2) up to 4% dillution is safe for adults. If i want to use a mix of carrier oil…rule will be the same..total of 1oz? ?like that of essential oil usaid total of 5 drops. I am trying to recreate an old oil that my face loved but that is sadly no longer available. The main ingredients were Shea Butter oil, castor oil, fractionated coconut oil, sea buckthorn oil, marula oil, rose hip oil, and sunflower seed oil. Am I correct that all of these are carrier oils? None are essential oils? If so, should I just experiment with different amounts of all these ingredients starting with an equal amount of each until I find what it right? THANKS!!! Hi Nadia. What a great blog and wensite! I’m very interested in making my own face oil blend, mainly to prevent additional aging. Can’t wait to try out your suggestions! How long will the carrier oil keep without going rancid? I’d like to try this but a lot of the carrier oils are sold in 4 oz jars. I’m wondering if I’ll end up wasting them. I made my own “cleanser” that I use with a cotton pad.. it’s rose water, tea tree oil, and vegetable glycerin. I am going to try your Castile soap wash, and I also have a witch hazel toner and Marula face oil for daily use. In what order/how often should I use these?/ what do you think about the ingredients? Hi Nadia, I am new to your blog but I have really been enjoying it. Over the past year and a half I have been switching out all products for natural alternatives. I used to be a Kiehls user, and have not found anything to replace their Midnight recovery concentrate. I have tried other serums and diy oil blends, but nothing is quite as effective for my skin or gives me the same glow. Any thoughts on how harmful this product is? I have seen mixed reviews online of the ingredient list and it is listed as a 3 on the Think Dirty app. Also open to natural alternatives or product recommendations. I look forward to hearing your thoughts! Hey, Lindsay! I’m so happy to have you as a new reader 🙂 Well a 3 isn’t bad, and looking through the ingredients – it actually looks pretty clean! I was happy to see fragrance isn’t even an ingredient. If you’re wanting to try something new, I’d recommend Beautycounter’s oil blends and serums (if you let me know exactly what benefits you’re looking for, I can point to a specific one for you): they have a cult following for good reason! I love all of these oils, and my favorites are frankincense and patchouli. Great article! Is this an ok blend? How many drops of vitamin e will i need to add? Hi, Nadia! Do you ever make/use body oils? I recently saw a coconut/jojoba lemongrass body oil at Trader Joe’s and it made me want to DIY a great body oil for myself. Would love your advice and input for the best ingredients and methods. Go for it! Be sure to use the same ratios of EOs and carrier oils as you would with a face oil 🙂 I prefer apricot kernel oil for my body – reasonably priced and sinks into the skin very well. For body cream (keep it moist) what are the ratios and EO/CO? They would be the same as with an oil blend! Hello I am completely new to this page and to face oils all together! I was wondering if adding an essential oil is a must and what the point of an essential oil is ? Is it just for the fragrance?? how many ml should the container be ? can you tell the measurements for rosehip seed oil grapeseed oil geranium lavender essential oils i should use. I want to mix hemp seed oil with geranium and tea tree essential oils. For 30ml of hemp oil, how much of each essential oil should I put on? And should I store it in the fridge after mixed? 15 drops total essential oils. And I would suggest that! I am starting to see Meadow Foam Seed Oil being using in skin care products. Is it a drying or nondrying oil and how does it benefit the skin? Do you have any thoughts on how to use essential oils in a mist instead of a carrier oil? Would I simply add the EOs of my choice to filtered water in the same dilution ratio as I would in a carrier oil? They won’t dilute in the water since they’re oil-soluble. They’ll just float on top. So excited! I just mixed my first custom face oil and hydrating toner 🙂 I was very impressed by your recommendation to use lavender oil for blemishes – super effective! So I figured, why not try? Hoping for good things. Yay very exciting 🙂 Hope you love it! And it’s so fun, right!?!? Can you please tell me for how long this mix if oils stay good to use? I have made a batch year(with few carrier and essential oil) but it’s not finished yet. What are the signs if I need to check whether this mix is sti good or not?? I’d say 6 months. The problem with oils isn’t so much bacteria growth as it is rancidity – you don’t want to be putting rancid oils on your skin! How do you feel about adding vitamin E oil directly to your face as apart of your moisturizing routine? I only add a drop or two and rub into specific areas of my face to reduce fine lines. Is this a bad practice and would it damage my skin at all to keep doing this? I really don’t know. I don’t think there would be any negative consequences BUT I also don’t think it’s probably the best option. Other oils are loaded with vit E… and C and A and other antioxidants! Hi Nadia, I’m trying to create a daily face oil for myself and I know you mentioned that 5 essential oils are enough, but some companies use more. One face oil that is very popular right now has 12 essential oils in it! Is that too many? I’m wanting to use around 10 for mine… I’m using Jojoba oil as my base and then would add around 15 drops of essential oil per 1 ml as you suggested. That said, I also made a blend of 5 herbs soaked in a jojoba oil base that I’d like to add to it as well. I’m just wondering if this is too many ingredients for a daily face oil. Also, are there any oils I should NOT mix together? PS I liked your advice about adding vitamin E oil, I’m going to use it 🙂 Thank You! You can really do whatever you want, Holly! Just keep a close eye on the essential oil dillution ratio. Hi.. I am currently suffering with PCOd that eventually gives me a lot acne over the face which further leaves me with scars to look at. My skin has gone porous which further adds on.. what oil blend u can best recommend me for this and to tighten the pores? The symtoms of PCOS/PCOD can be well managed with diet and supplementation though – I work on this with many clients. I have been looking for a website that details the oils like this for i don’t even know how long! I am so so excited to make my own blend. I have very dry skin and the only thing that works on my face is oils! Cant wait to make my blend! Thank you thank you thank you!!! I really want to make a face oil blend, however I feel I am blemish prone, oily & dry… so I am finding it hard to narrow down which carrier & essential oils to choose. I can’t really afford to trial and error a large variety of both carrier and essential oils (as I know organic is key) and am just wondering how to go about it so I don’t have wastage or lose of money on quality product. Thanks ! I just found your blog and I’m in love. This is a great go-to site for oil cleansing! Thank you for the detailed oils for skin type. Hello Nadia! I like your blog and love the informative way you present your article in. I have a question, can I mix jojoba oil and pumpkin seed oil? I have combination skin which is acne prone and is! I’m just starting to use oils for my face. Thanks! Also do the 30ML glass droppers need to be sterilized before i pour all the oils? And where can i purchase those mini funnels for pouring the oils into the glass droppers? I’m not sure this will ever be seen, but I’m a little dumb so, if I understand this right it’s 15 drops of essential per 1 oz of carrier? So if you make a 3 oz bottle, it should have no less than 45 drops of essential? From other recipes sites I’ve read it seems heavy, but I’m not getting good results with my mixture with is 25 drops per 3 oz carrier. Typical dillution is between 1 and 2.5%. As I said, 15 drops / oz is a 2.5% dillution so it is on the higher end. You can choose whatever you’d like! Thank you. I just wanted to make sure that I was understanding your instructions before I wasted more product by putting 45 drops in a 3oz solution. Hopefully by your guidelines i’ll see some results. Thanks again! Your blog is really nice, but I would have a question regarding dilution. You wrote that you follow 2.5% dilution, but when I read other articles about it, many recommended 1% dilution for face oils. Is it just to be safe not to have any reactions, or any other long-term effects it might have? Hi, I’ve been looking to replace my face serum. Would this face oil blend work like a serum? Sorry total newbie. Thanks! Hi, Jane! Well some companies call their oil blends “serums” but this is incorrect – serums are usually water-based and so penetrate the skin more deeply. They provide hydration (water) to the skin whereas oils provide moisture. I always suggest applying your oils last after your water-based products, including serums like hyaluronic acid or vitamin C serum. At this point, you might as well experiment since you have the oils and go from there! Hi! I’m just about to get my oils from my online order, and I’m pumped! But I’m wondering what the best combination of them will be amount-wise. I have oily skin with acne and acne scars, so I ordered Pumpkin seed oil, Hemp seed oil, Rosehip seed oil, and Tea Tree oil. I plan on doing a 2 oz bottle so I know I’ll only need maybe 10 drops of Tea Tree bc it’s so strong. Do you have any recommendations for ratio amounts of the three carrier oils based on their skin benefits? Hi, Nadia! Do facial oils replace your moisturizer or is it used in addition to a cream moisturizer? I’ve been researching facial care routines and products, and I want to make sure my skin is getting what it needs, but I also don’t want to put 15 different things on every morning! Also, should oils be used day, night, or both? Thanks for the guidance! Hi , I m new for this . I really want to ask my skin is really dry and I only using Carer oil . And I don’t want to use essential oil for my face skin , is it alright? At this stage I m mixing sweet almond oil and jojoba oil and rosehip oil . It’s a good combination? Or u can suggest me something different. But only natural oils. Thanks a lot. Can oil moisturizers be used as a day cream? As well can aloe Vera gel be mixed with oils? How good is boabab oil? Is it a carrier oil? Yes if you’d like but I would recommend wearing an SPF over it for sun protection. And you can mix aloe and oil in your hand to apply to your skin but they won’t stay mixed together if combined in a bottle – aloe is basically water and we know water and oil don’t mix! So you are saying for 1 oz essential oils 15 drops of each essential oil ? I have 3 essential oils I will be using. 15 drops of each correct ? How many teaspoons or table spoons of carrier oil ? No for 1 oz of CARRIER OIL you’d use 15 drops of essential oils TOTAL for a 2.5% dillution. What are the best oils for fading out melasma? Best oils for red acne spots,acne prone skin? Vitamin C is fantastic for reducing hyperpigmentation and rosehip seed oil is one of the best. But honestly, you’d do best with a vitamin C or niacinamide serum layered beneath your oil.